Would you eat cotton to be thin (all the models do!)? Home / Fashion / Would you eat cotton to be thin (the models do!)? Would you eat cotton to be thin (the models do!)? In what has to be THE craziest diet move of all times, 23-year-old model Bria Murphy (Eddie Murphy’s daughter), has revealed that many models eat cotton balls to stay thin. Unfortunately, she is not the only one to have brought this frightening fact into the limelight – enough models and minders have spoken about the “cotton ball diet” in the past to have us realise that this is indeed a “trend”. And exactly how is this savoury dish served up? Cotton balls are dipped in orange juice and then swallowed. The reason? You feel full sans any calories as the cotton balls just dissolve away after a while – they don’t add any fat or calories to your body. Sick as it sounds, this is just another version of extreme dieting that’s prevalent in the look-good-despite-feeling-awful circles. Earlier in the year, former Vogue Australia editor-in-chief Kristie Clements described similar behavior in The Vogue Factor , but with a twist: models eating tissues to stay off the calories. Different means, same effect. Forgive me for sounding lame and untrendy but I was always under the impression that one ate food for the nutrition that a body needs to function. Am sure that nobody here needs a refresher course in what happens when the body is starved of life-sustaining vitamins, minerals, proteins and even (gasp!) fats and carbohydrates. Not to say anything about what a steady infusion of cotton balls and tissues would do to the digestive system. What about you? 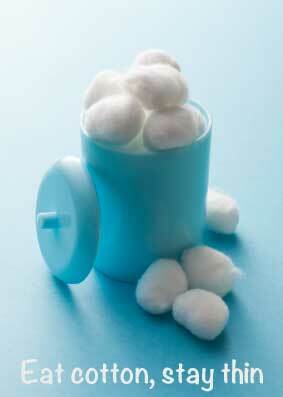 Tempted by the cotton ball diet? What’s the craziest or most extreme diet trend that you’ve come across? « What is your body acne telling you? Someone needs to tell them that the brain needs at least 250 calories a day to keep functioning, this is insane! The sad truth is that nobody gives them a job because they use their brains. Maybe they get those 250 calories from the Orange-Juice. What I find even more disturbing is that people who eat cotton balls serve as a standard for what women should look like and that if they do not look like this they are just lazy and not trying hard enough. Really? I am supposed to like a cotton-ball eating, nearly dead and possibly-mentally-damaged-because-they-don’t-have-enough-nutrition-to-function clotheshanger?